It is not always that you come across a Claude Monet in the world of literature. Prof. Tuhin Sanyal’s A Mirror More Truthful is something I would describe as one without mincing words. 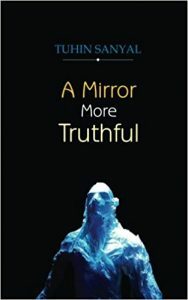 A Mirror More Truthful is an apt name for an Indian English poetry anthology, which is unabashedly truthful in the treatment of its chosen subjects. In a world fraught with pretense this piece of literature is as original and candid as it gets and to achieve all this through poetry is a Herculean feat not many will dare to even attempt. I was intrigued by the title of the book when I first laid my hands upon it. I asked myself, “A mirror more truthful than what?” It was after I went through the poems that I got to understand the gold standard with which Sanyal has evaluated the everyday glass and silver mirror we use to see ourselves in. I will come to that gold standard later in this review.